This recipe is so quick and easy to make, and it's healthy too! Try switching it up by using ground chicken or turkey for a different flavor. This will also help to reduce fat! This recipe is perfect for busy nights because many of these ingredients can be found in a budget pantry. Place ground beef in a non-stick saucepan over medium-high heat. Break up meat into crumbles using a spatula or wooden spoon while cooking. Add onions. Cook until all meat is brown (about 10 minutes). Pour meat and onions onto a paper-towel covered plate to absorb excess fat. Rinse the pan to remove excess fat. Place cooked and drained meat and onions back in the saucepan. 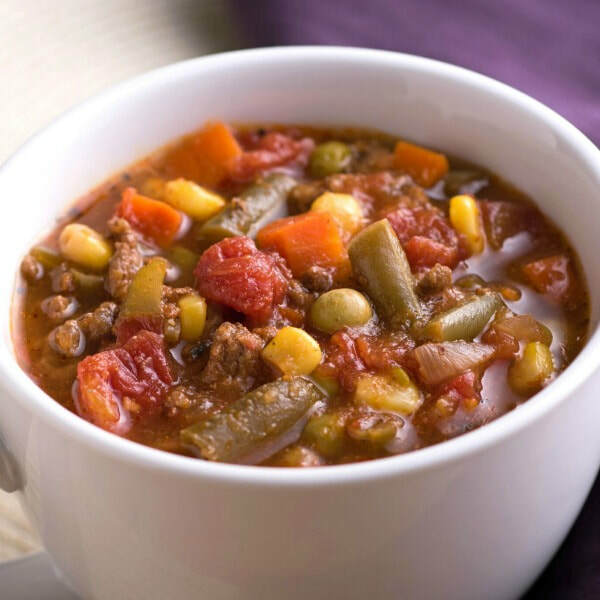 Add frozen vegetables, canned tomatoes and water, and cook until vegetables are thawed and the soup is hot.